If your child is swimming, always watch them. Young children and toddlers (even if they are in the kiddy pool) should be no further than arm’s reach. This allows a parent to provide “touch supervision” and react immediately. Inflatable toys and mattresses are not water safety equipment. And therefore, they should not be used in the place of such. These toys are prone to sudden deflating and your child could easily slip off them in deeper water. Ideally, there should be a fence around your pool if you have young children. In addition, the area around your pool, as well as the pool itself, should be maintained. There should not be any extrusions or areas where possible injury can take place. If you need a pool service, call us for inground pool repairs. With your inground pool installation, you likely had a pool cover fitted. This cover is in no way a safety measure. Its sole purpose is to keep the pool clean from most debris. Swimming children, while playing in the water, may very likely try to swim under it. Only to find that they are trapped. 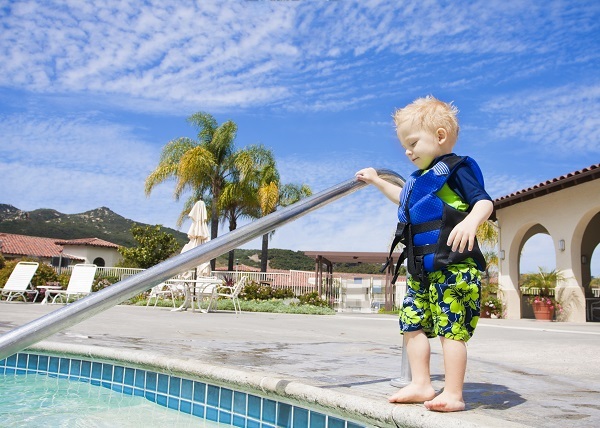 You should not only ensure that the cover is completely removed when the children are in the water, but also that they are taught not to walk on the pool cover or play in the water that may pool on top, as they could fall through at any point. If you are looking for inground pool repair, Mr. Pool is the way to go. With 30 years of experience in pool services, Mr. Pool is your go-to for pool repairs, maintenance, and new inground pool installations. At Mr. Pool we pride ourselves on honesty, trustworthiness, and impeccable service. Browse our site for new inground pools, or you can contact us for more information.